Mokuren Dojo: Tomiki's atemi isn't very striking, is it? ...[haven't] I always heard the first 5 techniques in Ju Nana are Atemi waza? If that's the case, I was just thinking about Ushiro......how is that atemi, if indeed it is? Ushiroate, as seen above performed by Tomiki Sensei, basically just involves pulling the guy down from behind. You certainly aren't hitting the guy, so why is this thing classified with the atemiwaza (striking techniques). This question pops up a lot. I've heard some instructors say that these are defenses against strikes - not that they are strikes themselves. I don't buy that because a) the atemiwaza can be easily applied against wrist grabs, etc..., and b) the whole of junana can be considered defense against strikes. That is certainly no basis for classifying these five techniques. There are also some instructors who point out that Tomiki probably had a different idea about atemi than we do. He certainly did not mean atemi to be a "chop uke in the nose," damaging impulse type strike. Ate in Japanese does mean to strike, but it also implies things like,"touch" or "apply." This creates enough linguistic give in the category of "striking techniques" to allow something like ushiroate to be grouped here. The answer I gave - the one that makes the most sense to me - is that the atemiwaza category contains both direct strikes and immediate consequences (variations/combinations/followups) to those direct strikes. The atemiwaza starts with three ways to attack the face directly in order to get an off balance and get control of uke's center. If you practice randori trying just those first 3 things, the next two things will rapidly evolve. Gedanate happens when uke will not allow you to hit his face, and ushiroate happens if uke crowds you too much. So, since #4 and #5 are natural consequences of the first three fundamental atemi, they are grouped together. The atemiwaza includes 3 strikes and 2 what-if's. 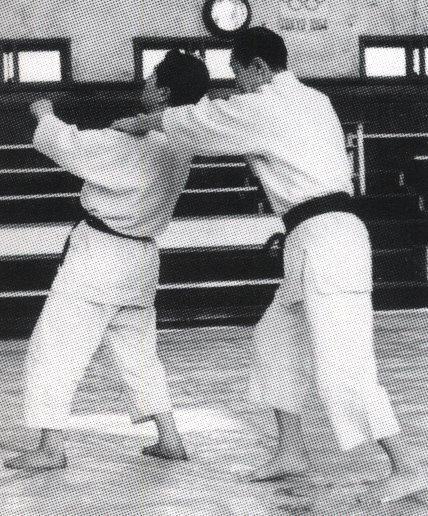 I was shown a close variation of this technique that has the throw happen because Nage kicks the back of Uke's knee or his back, or a one handed collar grab (or grab to the chin) with a strike to the lower spine from the other hand to make Uke fall down. Maybe this being referred to as atemi is more of a clue than something as explicit as the first four techniques. Thanks for the essays, you write well. I found your blog and looked through it and enjoyed it very much. I'll definitely be adding it to my list of blogs to watch.